Why did the United States develop political parties? How and why do party alignments change? Are the party-centered elections of the past better for democratic politics than the candidate-centered elections of the present? 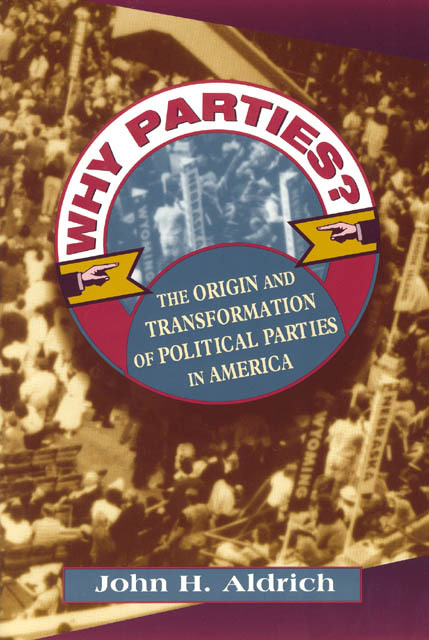 In this landmark book, John Aldrich goes beyond the clamor of arguments over whether American political parties are in resurgence or decline and undertakes a wholesale reexamination of the foundations of the American party system. Surveying three critical episodes in the development of American political parties—from their formation in the 1790s to the Civil War—Aldrich shows how parties serve to combat three fundamental problems of democracy: how to regulate the number of people seeking public office; how to mobilize voters; and how to achieve and maintain the majorities needed to accomplish goals once in office. Overcoming these obstacles, argues Aldrich, is possible only with political parties. Aldrich brings this innovative account up to date by looking at the profound changes in the character of political parties since World War II. In the 1960s, he shows, parties started to become candidate-centered organizations that are servants to their office seekers and officeholders. Aldrich argues that this development has revitalized parties, making them stronger, and more vital, with well-defined cleavages and highly effective governing ability. Book published by University of Chicago Press, 1995. Page maintained by BiblioVault.